Is your house ever really clean? I have also gotten rid of a TON of STUFF over the years. I’ve found I feel happier, more content, more peaceful with LESS stuff. If you have stuff, you must maintain said stuff. It’s a rule. I hate the rule, but it’s a rule and it’s true. I don’t have time to maintain STUFF. I have to maintain people. If I didn’t have little people, I could have time to dust knick-knacks, keep plants alive, vacuum twice a day (and have it stay clean), alphabetize my bookshelves, stack dishes neatly, etc. But I DO have little people. And they DO need maintenance… Pesky little things like cuddles, and snuggles. Sometimes the littlest ones even want NURSED or FED! Oy! And the diaper changes – can you believe they need MORE than one a day?!?!? Clean clothes, healthy snacks, read to them, and I guess, if you keep them home, you’re supposed to TEACH them too?!?! You can see how much time they take to upkeep! Nope, no time for maintaining both the little people AND the stuff. One of them had to go and the State really frowns on you dropping off the little people at Goodwill. So, the stuff had to go. It was a shame. I was attached to some of it…. 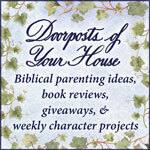 In other news, Doorposts has a new blog! They are also doing a huge giveaway. While I would LIKE to be the winner, it would be greedy of me not to share this news… Plus it gets me another entry. One has to wonder if the link share is greedy or compassionate?? ?